THE FBI WILL BE HIRING SOON - WILL YOU BE READY FOR THE CALL? The FBI Phase Two Interview and the FBI Phase Three Interview are the most intense and challenging interviews of their kind. I have coached thousands of candidates for the FBI as well as many others for jobs with other federal agencies. The packages that I offer are intended to get you ready to feel prepared, confident, and to be able to answer the questions that are asked with as much ease as possible. I have been coaching FBI candidates for over 15 years and have had a wonderful success rate helping people pass this unusual interview. The challenge is that the agents interviewing you will only know one thing about you - your name. They will not have access to any applications or other documents - it is a "blind date." Because the interview is primarily "behavioral based," preparation will be ESSENTIAL. Without it you will fail and have to wait a year or more before you can re-again. What a waste! AND if you fail again you're done. Whatever you purchase will be applied toward the full coaching packages once you get the green light to move on to the interview. 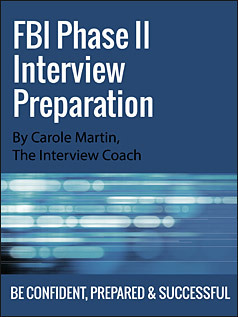 Through my training and behavioral interview certification, plus my experience working with literally thousands of candidates, I have put together an FBI Phase II and Phase III Preparation Packages that will help you focus and prepare for your upcoming experience. This intense exercise features an exclusive e-book and two thirty-minute audios of tips and examples by me based on my work and feedback from past clients. "I PASSED MY INTERVIEW! So I'm writing to say thank you! You really prepared me for the interview and the points and situations, etc. that we worked on were perfect! I was very prepared for all of the questions that they asked me, and look...it paid off! So anyway, I was just writing to let you know I passed, and to say thank you for your time and services. That was money well spent!! (How often do you get to say that??)" -- D.S. "Our meeting definitely helped me in getting ready, I was not nervous at all when I walked in. Advice I would offer to other candidates are: #1. Hire Carole Martin #2. Develop a strong introduction. #3. Practice, practice, and practice" -- Jim T.
"Your help definitely helped me pass... I just wanted to tell you that I just found out I passed the Phase II interview for the FBI. Thank you for your help in preparing for it. Your help definitely helped me pass, thanks again!" -- Sam L.
"Planning is crucial. I just found out that I passed the FBI Phase II interview. Thanks for your help. I can tell others who will be taking this test that planning is crucial. To have an approximate idea, and having answers ready for those situations was really helpful. Your exercises, phone coaching and tips really helped. Thanks again." -- W.Y. Phase II is a one-hour structured interview that consists of 13 standard questions. The interview will be administered by a panel of three evaluators and will take one hour to administer. The evaluators will be FBI Special Agents who have been trained thoroughly on how to rate your performance on the interview using standardized scoring criteria. Remember, the panel knows nothing about you and has no knowledge of your background. As a quality control measure, all interviews will be audio taped and the recordings will be stored at FBI Headquarters in Washington, D.C. The evaluators will be taking notes during the interview to document the results. Do not let this distract you. Provide detailed information when answering the interview questions. Do not be modest in your responses. To provide the best examples of your skills and abilities, draw from all of your life's experiences (not just the most recent ones). Remember that the interview panel has no applicant information about you. They have not seen your application. They only know your name. Do not make assumptions about what the evaluators are seeking. The interview instructions are straightforward. There are no "trick" questions. Study your resume and be able to speak about how your experiences match with the critical skills and abilities required of Intelligence Analysts. The e-Book contains exercises and information to prepare you for our work together and to get you ready to pass the interview. I have put together this special e-Book with information and exercises for you to prepare "behavioral questions." By focusing on the FACTORS desired by the FBI, rather than a long list of questions, you can prepare in a more focused manner. Having worked with clients who have had a very high pass rate for the past 15 years, I have seen many changes to the Phase II interview. One thing that remains constant is those key factors that they are seeking in a candidate. This book is an esential tool for your FBI Interview Preparation. I hear from people each week telling me that they passed the interview and how their work with me was worth "every penny spent." That makes me very happy! I really want you to pass this interview and will do everything in my power to help you. Many candidates that I coached through the process are now agents - and I'm really proud to have worked with them. I want that for you too! I am very straightforward with my advice - with the intention of improving your delivery and getting you ready to pass the interview. I am tough but also very supportive. I help you to prepare for these interviews with tools and techniques. It is up to you to use the tools to prepare for the interview. Two important factors in passing these type of interviews are PREPARATION and PRACTICE. You CANNOT WING this interview and pass. Because all of the questions are "behavioral questions" such as: "Tell me about a time when...," and "Give us an example..." I have focused on teaching you the technique of how to write and tell examples or "stories. I critique these stories for you as part of the coaching package. These options are available if you decide to upgrade your package or request more coaching time later on. Use this option only if you've already purchased the Self Preparation Package and have decided to upgrade to the Premier Preparation Package. Use this option only if you've already purchased the Premier Preparation Package (#1) and wish to get additional coaching. "Only 4 of 8 passed in our group...I had an edge. I just wanted you to know that I passed the FBI interview!!! Only 4 of 8 passed in our group and I know that you are the reason I had an edge. Thank you so much!" "You're the best! I can't thank you enough! I wanted to personally thank you for all of your help! I found out earlier today that I passed the FBI phase II interview! :) Thanks, thanks, thanks! Your lessons were a real help and you really prepared me for the type of experience I encountered. I found myself using many of the buzzwords we talked about... "time and project management skills", "completed school during the evening while working full-time", etc. You're the best! I can't thank you enough!" "You hit all the right points, especially, the SPARE/STAR approach. Thanks for all your coaching assistance. You are doing a great job, I've never experienced your type of preparation for a job interview. Your methods are very good. You hit all the right points, especially, the SPARE/STAR approach." -- Alex Z. "Behavioral interview preparation techniques helped a great deal. I just wanted to let you know that I passed the interview! It was tough but your behavioral interview preparation techniques helped a great deal. I'm convinced that preparation makes the difference, THANK YOU!" "I will certainly recommend you to anyone... Just wanted to let you know that I passed my FBI Phase 2 exam! Thank you so much for your help, you helped me get through this. I will certainly recommend you to anyone seeking interview coaching, so expect some calls from Chicago!!! Thank you so much Carole!" "The information that you gave me was invaluable... I just wanted to thank you for all of your help. I just received word that I passed the phase II interview. The information that you gave me was invaluable and it truly helped when you explained what they were looking for and how they evaluate someone in a behavioral interview. I don't think I could have done it without some of your coaching and I am truly grateful."